It took just seven weeks following the Japanese attack at Pearl Harbor for American troops to reach the shores of Northern Ireland. Within three months more than 10,000 American servicemen would be in Ireland but this apparently amazing logistical feat had been carefully planned since April 1941. At that time the War Department's RAINBOW-5 plan envisioned deployment of 30,000 troops in Northern Ireland . In reality, the figure would be closer to 50,000. By June 1941, a full six months before America 's entry into the war, American civilian contractor laborers began construction on US naval bases. 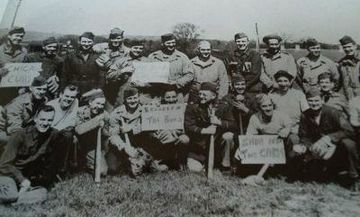 Special Observer Groups of the US Army were also present in Ireland at that time identifying suitable locations for airfields, army camps, hospitals and ammunition depots. The first troops to arrive in Northern Ireland was a contingent of 4,058 men of the 34th Infantry Division on January 26 th 1942. These proud young men from the Midwestern United States were followed in May 1942 by the 1st Armored Division from Fort Knox, Kentucky, with tanks and armored vehicles never before seen in this small part of the United Kingdom . It was evident that a competitive sports program could help improve matters, and team games of basketball and soccer, combined with track and boxing, went a long way to make amends. But America 's national pastime – baseball – had by far the greatest impact on morale. Neither team had uniforms, equipment was scarce, and a soccer field, without a backstop or pitcher's mound, served as a diamond for the afternoon. But baseball had arrived, and the troops welcomed it with open arms. 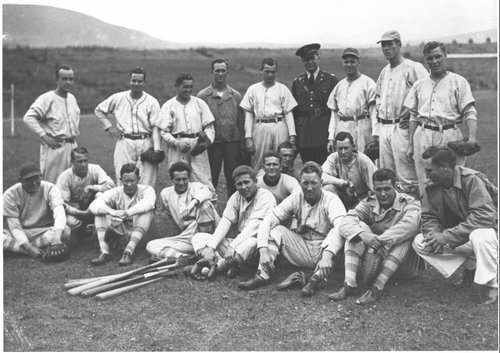 With the Army Air Force based at the Combat Crew Replacement Unit at Greencastle in County Down and the Langford Lodge Base Air Depot in Antrim, the Navy at the United States Naval Operations Base (USNOB) in Londonderry, and the Army scattered throughout the island, battalion-level baseball soon flourished on the Emerald Isle. 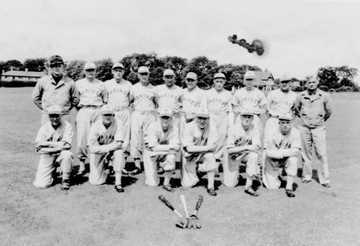 In July 1942, 34th Infantry and 1st Armored division all-stars teams were selected to participate in Northern Ireland 's first officially recognized baseball game of World War II. The last “official” game had taken place 25 years earlier, on October 31, 1917 , when Canadian and American troops put on an exhibition game for the local people. Staged at Windsor Park , a soccer stadium in Belfast , and a part of the Anglo-American Independence Day celebrations, the local government and American military pulled out all the stops to put on a July 4 spectacle. The Giants' line-up included Cleveland minor league pitcher Bob Lange and another fellow Indians' farm system hurler, Private Vernon Kohler. Kohler had an exceptional season with the Flint Arrows in the Michigan State League in 1940, with an 18-5 won-loss record that earned him a trip to spring training with the Indians in 1941. Catcher, Sergeant Orlando Langenfeld and second baseman Private Lester Zabel were talented semi-pro players and home-run-hitting Leo Robinson was in right field. The Wildcats were relying on the pitching talents of Private Troy Needham, a 29-year-old left-hander who had spent time in the Boston Red Sox farm system; hard-hitting semi-pro third baseman John Kratochwil; and Sheldon Bowen, a semi-pro center fielder and lead-off hitter. On a fine, clear afternoon, an enthusiastic crowd, including Northern Ireland 's Governor General (the Duke and Duchess of Abercorn), Prime Minister (John W Andrews) and members of the Cabinet and Government. The first team couldn't do the job, so they sent in the subs. The subs did it. That's the story of the 3 to 2 victory the Mid-West Giants scored over the Kentucky Wildcats in an Independence Day baseball game played in Belfast before an enthusiastic, albeit somewhat bewildered, crowd of more than 7,500 fans, most of them civilians who had never before seen a sample of the great American National Pastime. The Giants were trailing by a 2 to 1 score, going into the last half of the eighth inning. Then the new team, which had taken over at the start of the seventh frame, took the situation into hand and blasted across the tying and winning runs. During the two hours and seven minutes which the game lasted, the spectators were treated to a pitchers' battle, featured by some spectacular (and some sloppy) fielding, and a bit of clever base running. It was John Kratochwil's double in the third inning, scoring Sheldon Bowen, that opened the scoring for the Wildcats. Kratochwil also scored that inning, but the Giants pulled a run back in the sixth and added a further two runs in the bottom of the eighth to take a 3-2 lead. 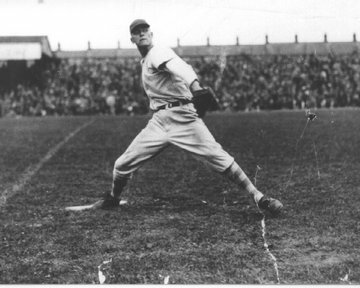 In the final inning, Giants' relief pitcher Corporal Donald Shelton, a big, raw-boned high school star, pitching in relief of Lange and Kohler, forced the first two batters to ground out and then retired the third on an easy fly to the shortstop to preserve the win. 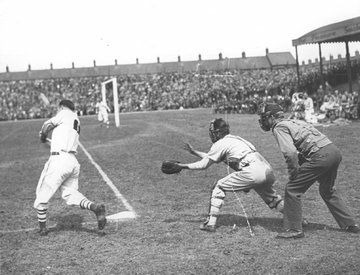 There was no pitcher's mound at Windsor Park ; base runners had to skillfully avoid colliding with a soccer goal post down the first base line, and spectators gathered dangerously close to home plate, oblivious to the possible danger they faced. But the game was a success with both the public and military and paved the way for many further exhibition games over the following years. Leo Robinson later described the day in a letter to his parents. 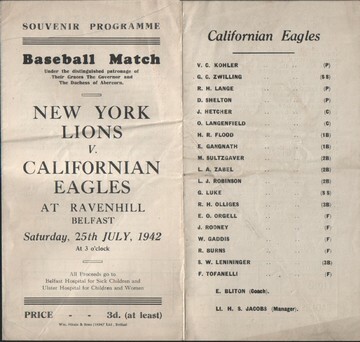 [I] was given time off to play baseball in Belfast the 4th of July. Had a very good time. Had a crowd of about 10,000 people. Even met some royalty as the ball team met and shook hands with the Duke of Abercorn. Had a great time after the game, signing autographs. Made us feel as if we were somebody. The players had another opportunity to feel important when the same teams faced each other on July 25, in a benefit game for the Belfast Hospital for Sick Children and the Ulster Hospital for Children and Women. The 34 th Infantry Division, despite a wobbly pitching performance by Vern Kohler, held on for a 9-6 win and a good sum of money was raised. During the late summer of 1942, preparations for the Anglo-American landings in North Africa saw an intensification of combat training and the opportunity to stage division-level games became limited. Yet baseball continued to thrive at the battalion level, fueled by 100,000 additional troops who arrived during August and September. The pitching ace of 1943 was 26-year-old Ed Behnen, a left-hander with the US Army Headquarters. Behnen, from East St Louis , Illinois , who pitched for Grand Forks in the Northern League in 1940. Behnen hurled a no-hitter in late May, and then set a league record the following month with 18 strikeouts in a single game. The US Navy base at Londonderry was constantly expanding as it became the coordination center for the war against the German U-boats, and in addition to having a team in the Belfast league; it operated its own league during the summer months with teams representing the Navy, Sea Bees, Naval Hospital and Marines. It was the Beech Hill Marine Corps detachment that clinched the Naval Operations Base (NOB) five-game playoff series in September. First-Sergeant Bill Robinson managed the Marines, aided by Robert “Red” Kimball, a pre-war semi-pro pitcher with Garco of Charleston, South Carolina and the Marion Swamp Foxes from North Carolina , and Charles Ziober, formerly with the Newark Bears, provided offensive punch. In 1944, the American presence in Northern Ireland rapidly declined with the Allied advance into mainland Europe . However, the Navy operated a successful season that opened May 18. It was the Beech Hill Marines, 1943 NOB champions that dominated the season. They crushed the Lisahally Supply team, 16-0, on opening day and went on to clinch their second league title.